Background: Typhoid fever continues to remain a major public health problem especially in the areas where there is problem of sanitation and hygiene. The emergence of multidrug resistance of Salmonella typhi, the bacteria responsible for Typhoid to ampicillin, chloramphenicol, and cotrimoxazole has further complicated the treatment and management of enteric fever. One strategy for the treatment of the multidrug resistant bacteria is to use herbs in combination with conventional drugs. The present study was done to find out the interaction effect of phenolic, nonphenolic fractions, and volatile oil of Origanum vulgare with ciprofloxacin. Materials and Methods: The minimum inhibitory concentration (MIC) by microdilution method for individual phytoconstituents and in combination with ciprofloxacin was compared for clinically isolated bacteria from patients infected with S. typhi. Fractional inhibitory concentration (FIC) and Fractional inhibitory concentration index (FICI) were also calculated. Results: The MIC declined to a significant level indicating synergistic relationship between ciprofloxacin and phenolic, nonphenolic fractions and volatile oil in vitro. The FICI exhibits synergistic effect for all the three samples while indifferent and antagonistic for samples and for phenolic and nonphenolic fractions. Conclusions: Present study shows that not only the formulation using O. vulgare and ciprofloxacin can overcome multidrug resistance but also will reduce the toxic effects of ciprofloxacin. Treatment regimens based on traditional medicine (including herbal medicine) remains widespread in developing countries and is finding greater acceptance in developed countries. Traditional medicine can be an effective alternative source for antibiotic resistant strains, particularly after the recent dramatic failures of antibiotics against multidrug-resistant microorganisms. Antimicrobial compounds isolated from traditional medicines shows activity after long term use and consumption in high concentration. There are possibilities of developing antimicrobial compounds with no more resistance if already standardized synthetic antibiotics are used in combination with isolated active constituents of herbals. We explore such an approach in this study by assessing the antimicrobial interaction effect of the phenolic, nonphenolic fractions, and volatile oil of Oreganum vulgare Linn. (Lamiaceae) with a standard synthetic antibiotic ciprofloxacin. The freeze dried leaves of O. vulgare Linn. were procured from Aum Agreefresh Pvt. Ltd., Vadodara, Gujarat and were identified by the same company. The voucher specimen (Pcog1101) was deposited in Department of Pharmaceutical sciences, Guru Jambheshwar University of Science and Technology for future references. The bacterial strain used was S. typhi, isolated clinically from three different patients at the Civil Hospital, Fatehabad, Haryana, India. Bismuth sulphite agar media (Hi-media, India) was used for colony growth from blood sample. The bacterial strains were grown to exponential phase in nutrient broth (NB) at 37°C for 24 h. NB was used (Hi-media, India). Ciprofloxacin (Hi-Media, India) was used as standard antibiotic. All other chemicals used were of analytical grade. Volatile oil was extracted from freeze dried leaves (1000 g) by hydrodistillation method using clevenger's apparatus. The yellowish oil (16.6 mL, yield = 1.66% v/w) obtained was separated from aqueous phase and dried over anhydrous sodium sulphate and stored at 4°C until used. The oil sample was diluted with hexane in a ratio of 1:100 and used for the further analysis. The quantitative analysis was done with the help of chromatographer in gas phase (Agilent 7890A GC system) equipped with MS detector (5975C inert XL EI/CI MSD), HP-5MS capillary column (Agilent 19091S-433: 1548.52849 HP-5MS 5% Phenyl Methyl Silox) having dimensions 30 m × 250 μm × 0.25 μm. The column temperature was pre programmed from an initial 80°C upto 300°C. The temperature of the injector was fixed at 270°C. The debit of gas (helium) vector was fixed to 1mL/min and split injection with split ratio 50:1. The volume of injected sample was 2 μL of diluted oil in hexane (10%). The components were identified based on comparison of their relative retention time and mass spectra with those of standards, W9N08.L library data of the GC-MS system, and literature data. All the three samples of blood obtained from patients suffering from typhoid were properly labelled and their isolation was carried out by serial dilution method. From each sample, 1 mL of the blood was dissolved in 9 mL of 0.1% saline and then was serially diluted up to twofold dilutions. Then, 1 mL of blood from each dilution was poured in different sterilized petri-plates. The plates were labelled to indicate respective dilutions. Bismuth sulphite agar media was poured in the plates and allowed to solidify. After solidification of the media, plates were kept in an incubator for 48 h at 37°C. After 2 days, black color colonies appeared on the plates and they were then transferred to a liquid nutrient broth medium. , The colonies were subjected to carbohydrate utilization involving glucose, lactose, sucrose, manitol, salicin, dulcitol, and melibiose fermentation test which differentiate S. Enteritidis and S. typhimurium. The broth culture was incubated at 35°C until it achieved the turbidity of the 0.5 McFarland standards (usually takes 2-6 h). This results in a suspension containing approximately 1-2 × 10 8 cfu/mL. The turbidity of the actively growing broth culture was adjusted with sterile broth to obtain turbidity comparable to that of the 0.5 McFarland standards. MIC was determined by a modified method as previously described. 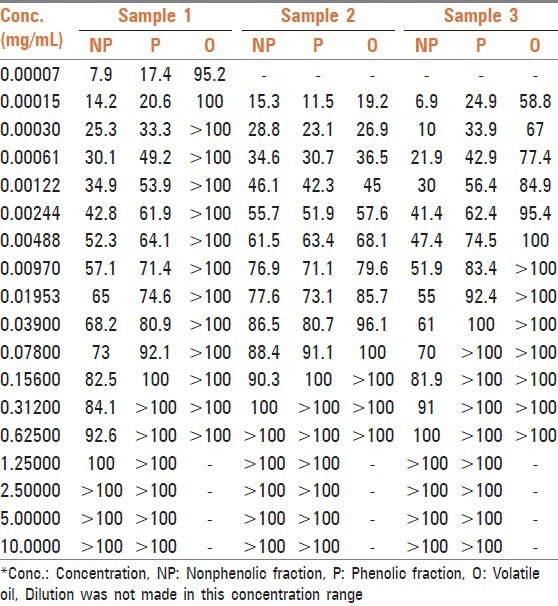 , The concentration of stock solutions of phenolic and nonphenolic fractions was 10 mg/mL, and that of ciprofloxacin was 0.25 mg/mL in DMSO. A total of 0.5 mL of phenolic and nonphenolic fractions and volatile oil were mixed with 0.5 mL of ciprofloxacin, respectively. MIC of phenolic, nonphenolic fraction, volatile oil, and ciprofloxacin was determined using twofold serial dilution method. For determination of interaction effect of phenolic, nonphenolic fractions, and volatile oil, 0.5 mL of respective test samples were mixed with 0.5 mL of ciprofloxacin stock solution. Tubes containing only bacterial suspensions and nutrient broth were used as positive controls and negative controls were the tubes with only nutrient broth. 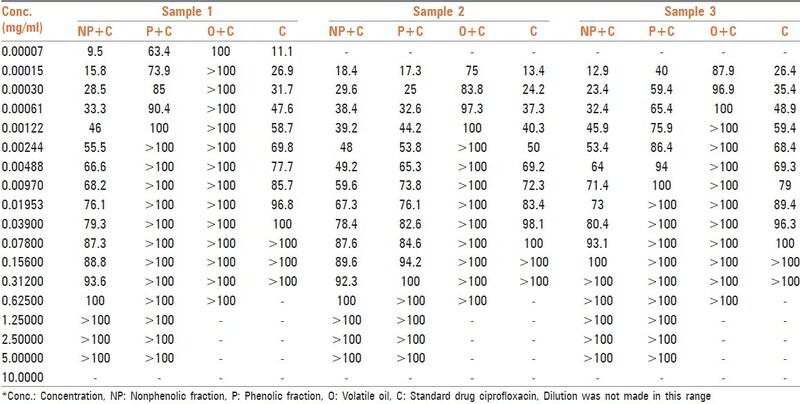 Percent inhibition = 1-(OD of tube containing test solution/OD of corresponding control tube) ×100. The MIC is reported as the lowest concentration of test material which results in 100% inhibition of growth of the test organism. FICI (nonphenolic fraction) = FIC of nonphenolic fraction + FIC of antibiotic drug. Thirty-five compounds were identified from volatile oil in different proportions. The major constituent was identified as carvacrol (86.5%) followed by π-cymene (7.24%) and 4-Terpineol (0.56%). Inhibitory effects of O. vulgare essential oils and of carvacrol against gram-negative bacteria have been confirmed. [Table 1], [Table 2] and [Figure 1] represent MIC in mg/mL. Volatile oil alone shows significant inhibitory activity against all the three clinical isolates of S. typhi at 0.00015, 0.078, and 0.00448 mg/mL, respectively, while MIC of phenolic fraction was 0.156, 0.312, and 0.03900 mg/mL, respectively. The MIC value is higher for nonphenolic fraction as it shows inhibitory activity at 1.25, 0.312, and 0.625 mg/mL, respectively. The interaction effect studies represented interesting results as addition of volatile oil in ciprofloxacin decreased the MIC of ciprofloxacin to 0.00007, 0.00122, and 0.00061 mg/mL, respectively in three bacterial isolates. Similar synergistic results were obtained for phenolic fraction and volatile oil of which carvacrol, a phenol, is the major component of oil. The phenols are known to damage the membrane of microorganisms first, making the cells more sensitive. As a consequence, impairment of proton pumps and loss of H + -ATPase in damaged membranes can cause disruption in the normal cellular function of the microorganism and therefore lead to cell death. Further, the acidic nature of phenols containing extracts themselves at higher concentrations may create a low-pH microenvironment due to proton donation and cell membrane disruption due to stacking,  which is likely to be more effective than low pH alone. Several authors observed that volatile oils are rich in phenolic compounds possessing high levels of antimicrobial activity. , The FIC and FICI calculated are listed in [Table 3]. The FIC of volatile oil for all the three isolates were 0.466, 0.015, and 0.125, respectively; 0.007, 2.000, and 0.248 for phenolic fractions; and that of 0.500, 2.003, and 0.249 for nonphenolic fractions, respectively. The FICI was calculated to describe the interaction studies. Synergy is defined as an FICI of ≤ 0.5. Indifference was defined as an FICI of ≥ 0.5 but of ≤ 4.0. Antagonism was defined as an FICI of > 4.0. The FICI calculated for volatile oil was 0.467, 0.030, 0.132 for S. typhi samples, respectively, which indicates that volatile oil shows synergistic activity along with ciprofloxacin. The FICI was 0.038, 6.000, and 0.372, respectively, for phenolic fraction which demonstrates that for samples 1 and 3 phenolic fractions act synergistically; while for sample 2, it exhibits antagonistic activity when combined with ciprofloxacin and 16.525, 10.015, and 2.249, respectively, for nonphenolic fractions. FICI > 4 of nonphenolic fraction for samples 1 and 2 explains its antagonistic behavior while indifferent for sample 3. Results presented in this study reveal that O. vulgare, a culinary herb, can overcome multidrug resistance if used in antibiotic therapy along with lesser doses of synthetic antibiotics and may lessen the toxic effects of synthetic drugs. 1. Rattanachaikunsopon P, Phumkhachorn P. In vitro study of synergistic antimicrobial effect of carvacrol and cymene on drug resistant Salmonellatyphi. Afr J Microbiol 2009;3:978-80. 2. Murray PR, Farrell R. Medical microbiology. London: Mosby; 1994. p. 227-40. 3. Harish BN, Menezes GA, Sarangapani K, Parija SC. A case report and review of the literature: Ciprofloxacin resistant Salmonella enterica serovar Typhi in India. J Infect Dev Ctries 2008;2:324-7. 4. WHO traditional medicine strategy; 2002. p. 7-9. 5. Abdallah EM. Plants: An alternative source for antimicrobials. J App Pharm Sci 2011;1:16-20. 6. Raul AS, Guadalupe M, Franco G, Camacho-Davila A, Torres-Munoz JV, Nevarez-Moorillon GV, et al. Extracts of Mexican Oregano (Lippia berlandieri Schauer) with antioxidant and antimicrobial activity. Food Bioprocess Technol 2010;3:434-40. 7. Andrews WH, June GA, Sherrod PS, Hammack TS, Amaguana RM. Salmonella. In: FDA Bacteriological analytical manual. 8 th ed. Gaithersburg: AOAC International; 1995. p. 5.01-5.20. 8. Wilson WJ, Blair EM. A combination of bismuth and sodium sulphite affording an enrichment and selective medium for the typhoid-paratyphoid groups of bacteria. J Pathol Bacteriol 1926;29:310. 9. Cox NA, Williams JE. A simplified biochemical system to screen Salmonella isolates from poultry for serotyping. Poult Sci 1976;55:1968-71. 10. Kaya E, Ozbilge H. Determination of the effect of fluconazole against Candida albicans and Candida glabrata by using microbroth kinetic assay. Turk J Med Sci2012;42:325-8. 11. Eloff JN. A sensitivity and quick microplate method to determine the minimal inhibitory concentration of plant extracts for bacteria. Planta Med 1998;64:711-3. 12. Saad A, Fadli M, Bouaziz M, Benharref A, Mezrioui NE, Hassani L. Anticandidal activity of the essential oils of Thymus maroccanus and Thymus broussonetii and their synergism with amphotericin B and fluconazol. Phytomedicine 2010;17:1057-60. 13. Dorman HJ, Deans SG. Antimicrobial agents from plants: Antibacterial activity of plant volatile oils. J Appl Microbiol 2000;88:308-16. 14. Tegos G, Stermitz FR, Lomovskaya O, Lewis K. Multidrug pump inhibitors uncover remarkable activity of plant antimicrobials. Antimicrob Agents Chemother 2002;46:3133-41. 15. Shetty K, Wahlqvist ML. A model for the role of proline-linked pentose phosphate pathway in phenolic phytochemical bio-synthesis and mechanism of action for human health and environmental applications. Asia Pac J Clin Nutr 2004;13:1-24. 16. Panizzi L, Flamini G, Cioni PL, Morelli I. Composition and antimicrobial properties of essential oils of four Mediterranean Lamiaceae. J Ethnopharmacol 1993;39:167-70. 17. Sivropoulou A, Papanikolaou E, Nikolaou C, Kokkini S, Lanaras T, Arsenakis M. Antimicrobila and cytotoxic activities of Origanum essential oils. J Agric Food Chem 1996;44:1202-5. 18. Agrawal A, Jain N, Jain A. Synergistic effect of cefixime and cloxacillin combination against common bacterial pathogens causing community acquired pneumonia. Ind J Pharmacol 2007;39:251-2. 19. Nicolson K, Evans G, O'Tool PW. Potentiation of methicillin activity against methicillin-resistant Staphylococcus aureus by diterpens. FEMS Microbiol Lett 1999;179:233-9. 20. Burt S. Essential oils: Their antibacterial properties and potential application in foods-a review. Int J Food Microbiol 2004;94:223-53. 21. Juven BJ, Kanner J, Schved F, Weisslowicz H. Factors that interact with antimicrobial action of thyme essential oils and its active constituents. J Appl Bacteriol 1994;76:626-31.